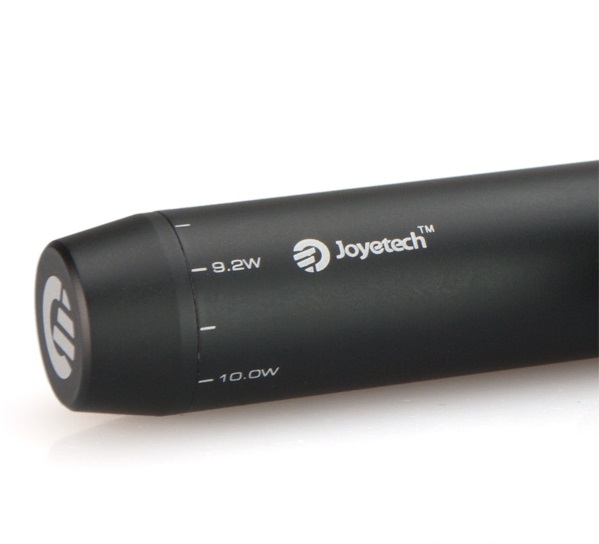 Joyetech has an ever growing range of new and innovative products that show an individual style and elegance encapsulating the advanced technologies that lay within. The all new eCom-C I’m reviewing today is a classic example of this. With its slender design, choice of colours and ease of operation, don’t be fooled into thinking that it lacks the power to outperform other rivals in its class. 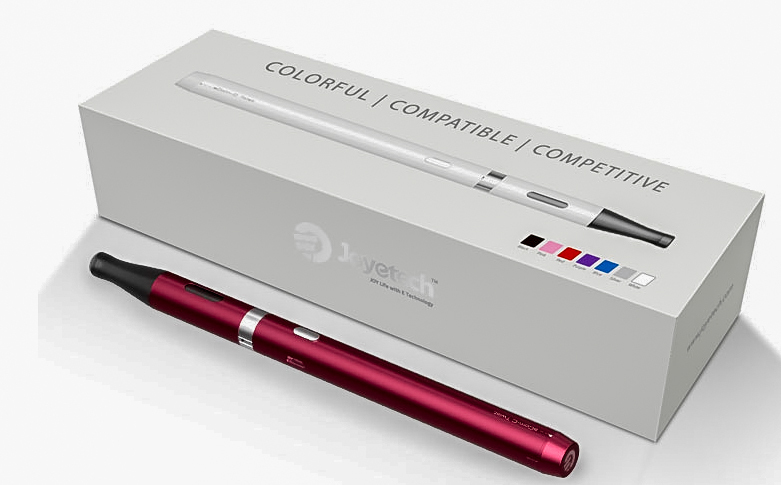 The eCom-C twist arrived in a cellophane wrapped, smartly packaged and well constructed white box, with a picture denoting the actual size of the assembled device to be found inside, along with a colour palette of the choices offered to the consumer in this particular range from Joyetech. The words Colorful Compatible Competitive are printed above a picture of the device, which have been borne out to be very accurate in this review. The familiar silver Joyetech logos can be found on the right-hand side of the box with the word eCom-C printed along the front of the box, with the website address printed on the right. The rear gives a brief description of the product and included parts, and the purpose it has been designed for, along with an age rating of 18yrs and above, including some health guidelines that are thoughtful on their part. Please do take note. Also a small sticker denoting the product colour contained inside, along with Atomizer type (A), and battery type (Twist 650mAh or (900mAh), is attached to the bottom. Be sure to check you have the correct colour and battery size before opening. And finally the words, Made in China with associated trademarks printed underneath. Also please be sure to check the warranty period should it be included with this device prior to purchasing. Lifting off the cover you will be presented with the fully assembled eCom-C.
Just remove the device from the box by lifting the silver thread on each side simultaneously, or by inserting your finger into the gap at the top close the to the mouthpiece. Removing the top part of the packaging, you will find two other boxes, one manual, and your warranty card with a scratch check security code sticker on the reverse side. The slightly larger white box contains one spare mouthpiece (the last thing we need in my house! ), one spare Atomizer C2 head, Two spare USB covers, One USB cable, One wall adapter, and Two mouthpiece covers. The smaller white box contains One Wall adapter that connects to the supplied USB cable for charging your device. Keeping pace with the ever-changing face of today’s devices due to the rapid technology advances in their design is no easy task; however the benefits for the consumer are considerable, not only because of the improvements in battery performance and safety features including low battery warning, and short circuit protection, but also in flavour and vapour production as well. So on that note let’s take a look at what makes up the New eCom-C from Joyetech. Arriving in a choice of seven different colours to cater for your own personal choices, Black, Pink, Red, Purple, Blue, Silver, and White, the eCom-C is not only pleasant on the eye but tactile as well, with a smooth, soft metallic feel. 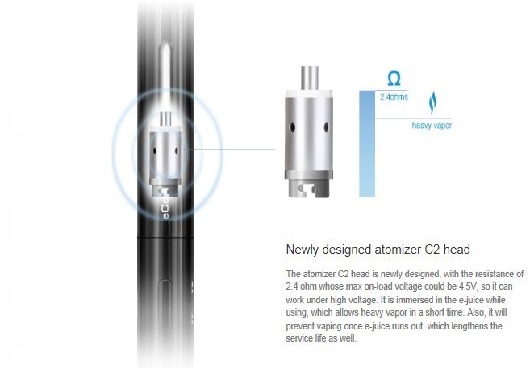 The newly designed Type A Atomizer is the heart of the eCom-C and is made up of four parts. These include the mouthpiece, Atomizer tube, Atomizer C2 head, and the base. It comes assembled with a changeable atomizer C2 head with a resistance of 2.4 Ω ensuring high vapour output at the maximum 10.5w setting. To fill, simply turn the Atomizer upside down and unscrew the atomizer base; then refill the e-juice along the tube wall avoiding the centre hole. Another highlight for the eCom-C is the VW mode with a range of (5.1W-10.0W). You can adjust the wattage, according to your own personal preferences. The battery includes a low battery warning function, short circuit protection, and the current state of charge. The low battery warning activates when the device is in the power-on state and reaches a low battery state. The power button light will flash 40 times, and the device will shut down automatically. Also, while pressing the power button, if the remaining power is 60% or above, the corresponding mode light will stay on, and when it is lower than 60%, the light flashes continuously. The less the power remains the faster the light flashes. When the power is within 30%-59%, the light flashes slowly; within 10%-29%, the light flashes at normal speed; within 0%-9%, the light flashes at a higher frequency. With the inclusion of variable wattage mode, the output can be adjusted from (5.1W-10.0W) simply by rotating the regulation ring clockwise or counter clockwise. This will help you to increase vapour output at the higher settings, and find the correct balance for vaporizing your particular brand of E-juice. Battery Dimensions: Diameter: 14mm Length (510):109.5mm Battery Capacity: 650 & 900mAh configurations are available. Charging the device is a simple and straightforward operation by connecting it with a computer or a wall adapter via USB cable. When plugging it into a power source, the button light will blink five times, and the light will keep blinking during charging. When it’s fully charged, the button light will stay on. The eCom-C is also 510 compatible making it a more flexible and versatile device for interchangeability of all other 510 eGo cone threading compatible products. Please remember never to leave your device charging unattended. For the purpose of this review, I used the included Joyetech Atomizer along with the Joyetech Delta & Aerotank Mini to test the 510 compatibility feature of the eCom-C. 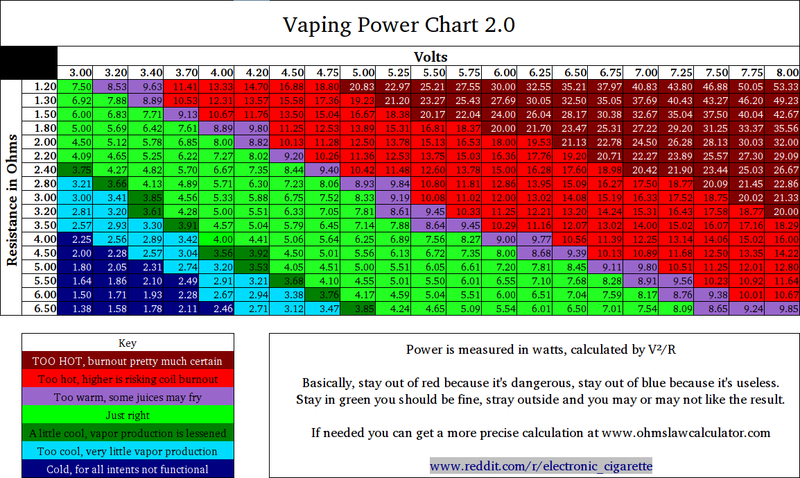 I have also used a selection of different E-juices with varying flavours and PG/VG mixtures including 100% VG on all of the power settings included with this device, using the ranges suggested in the chart supplied here for added consistency. The position of the power button sits just about right in the hand and is slightly raised above the main body making it easy to find without having to look for it. It requires the minimum amount of pressure to fire, with a reassuring soft click when activated. The tank holds enough E juice for a full working day vape for most people, and should you require a refill the space around the inside of the tank is plentiful compared with most, so there is far less likelihood of an accidental spillage while on the move. Vapour production and flavour are amazingly good for a device of this size. So it would appear the newly designed features of their latest Atomizer have played a very large in this, and the power output for a device of this size impressed me also. With a variable wattage from 5.1w-10w and an easily adjustable and clearly marked regulation ring at the base of the battery housing for fine tuning your settings, it covers all of the recommended vaping ranges suggested in the chart supplied, producing more than adequate amounts of vapour for its size with excellent flavour reproduction as well. The eCom-C has performed faultlessly throughout this review. 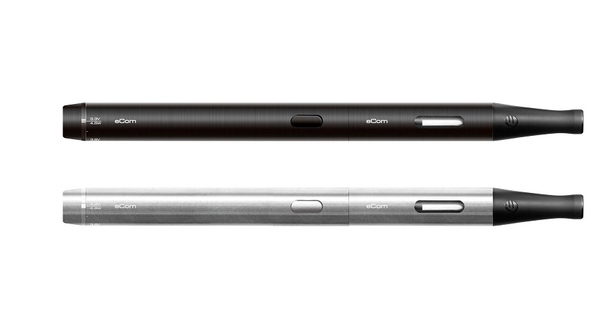 It has clearly been designed as a vaporizer that you can take anywhere in comfort due to its sleek design. I found it comfortable to carry inside my jacket with no noticeable weight penalty at all. Joyetech has improved the quality further still from earlier versions of this device sufficiently to make it worth your while upgrading to the latest model, or if you are a new user wanting to experiment with adjustable power settings in a variety of tasteful colours, then this is a very worthy contender for your consideration. 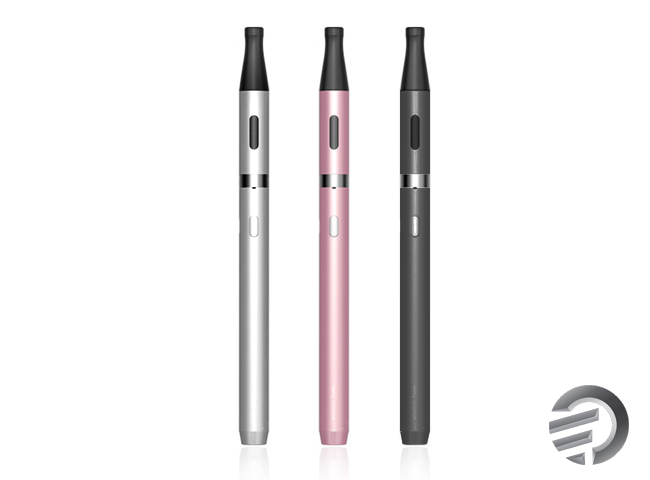 Thanks to Joyetech for providing the Technical specifications for this review and Images of the eCom-C.